Nobody wants to arrive too early. Being the first guest might mean you’ll catch the host before she’s done preparing. Unless you’re a close friend, that can be a faux pas. And sometimes, you don’t even want to be the second or third guest (we’re talking about a real party, not “dinner with friends” or nonsense like that). Nobody wants to be right on time, either. What if you don’t know the other punctual guests? What if you then have to meet new people and, God forbid, remember their names for the rest of the night? What if you try to pull the classic “Uh, I need a cigarette” trick right after you walk in because it’s so awkward? Faced with an easy choice — get to a party on time and feel weird, or go late and arrive when everyone’s there — we’ve all adopted an unspoken rule: We arrive a bit after the advertised start time. For hosts, there’s a simple solution. Say your party begins before you actually want it to, and tell a few friends to come early to help you set up. 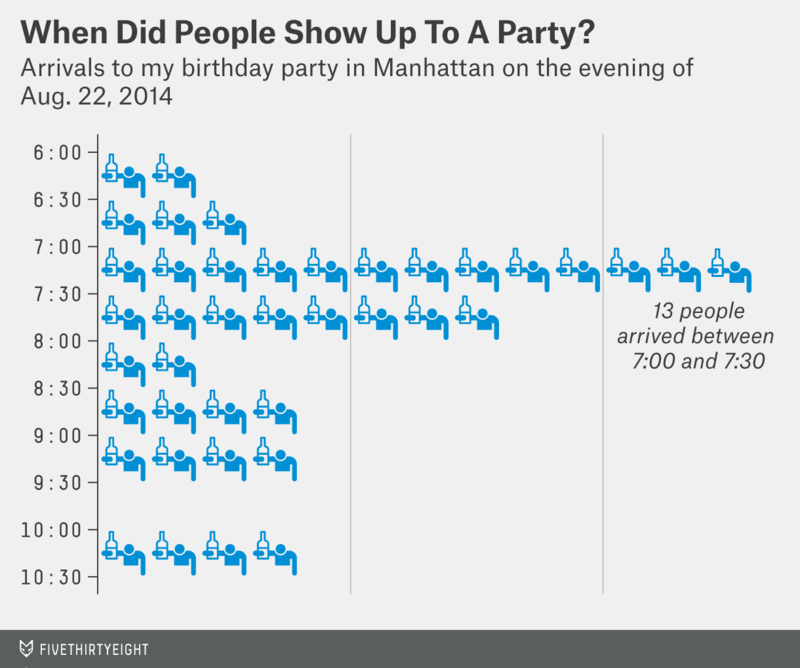 I did this last Friday night, when my friend Pam and I threw a joint birthday party at a bar in Manhattan — I wanted to find out, in detail, when people show up to a bash. We told people to get to the bar about 7. I arrived about 45 minutes early with another friend to score some tables. At 6:17, I started the stopwatch on my cellphone. Whenever someone showed up, I lapped it. To be clear about how lackadaisical we’ve become when it comes to arrival times, Pam showed up to her own event 10 minutes late. Intuitively, this makes total sense. The median time of arrival was 7:37, which confirms what I was expecting. Based on this event alone, I could estimate that just over half of invitees who will eventually show up to a party will get there 40 minutes after it starts (this might be useful when planning for, say, pizza acquisition). A quarter of the guests didn’t show until an hour-and-a-half after the shindig started. But the thing is, this is only one event. This is basically an anecdote. We can’t find any durable answers to this etiquette question after a single birthday party at One Star Bar. We need data. And for that data, we need you. Email the pictures to walter.hickey@fivethirtyeight.com and tell me what time you said the party started and what time you started the clock. I’m also interested in other details: how many people you invited, what type of party it was (frat party, baby shower, cocktail party — we want to hear about it!) and anything else that might be relevant. We’ll take care of the rest. In early October, we plan to publish what we find out (including your raw data). Volunteers will be graciously thanked on Twitter and in the coming piece. We’re aiming to end the submission period Sept. 30.